A top-secret multi-billion dollar U.S. spy satellite launched from Cape Canaveral on Sunday reportedly failed to separate from the upper stage of its SpaceX Falcon 9 rocket and never reached orbit. The technology website Ars Technica cites one source as saying the "the payload fell back to Earth along with the spent upper stage of the Falcon 9 rocket." The satellite, code-named Zuma, appears to be "a write-off," according to a source quoted by Reuters. During Sunday's launch, SpaceX initially broadcast ground control communications, but switched it off several minutes into the flight, citing the secret nature of the payload. Speaking on Monday, SpaceX spokesman James Gleeson appeared to be sticking with the commercial space-launch service's initial assessment of the launch: "We do not comment on missions of this nature; but as of right now reviews of the data indicate Falcon 9 performed nominally." Northrup Grumman, the manufacturer of Zuma, also declined to comment. 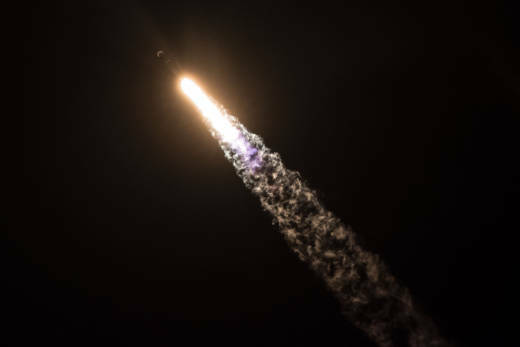 The Falls Church, Va., based defense contractor built Zuma and was responsible for choosing SpaceX to launch it, according to sources quoted in The Wall Street Journal. No details of the satellite, or which government agency was to have operated it, have been made public. The Journal's source said an investigation of the launch is under way, but there is no immediate sign of sabotage or other interference. Although there was no official confirmation of the satellite's loss, the U.S. Strategic Command, which monitors 23,000 man-made objects in space, told Bloomberg that it was not tracking any new satellites since Sunday's launch. "We have nothing to add to the satellite catalog at this time," Navy Captain Brook DeWalt, a spokesman for the command, wrote in an email to Bloomberg. SpaceX, run by entrepreneur Elon Musk, has sent more than a dozen resupply missions to the International Space Station, most recently in December. The company launched its first satellite for the U.S. military in May of last year.